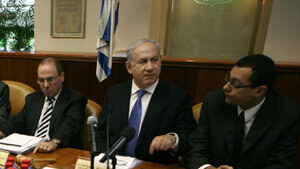 Israel Prime Minister Benjamin Netanyahu, center, chairs the weekly Cabinet meeting Sunday in Jerusalem. Israeli PM welcomes endorsement, says talks should be "without preconditions"
Jerusalem (CNN) -- Israeli Prime Minister Benjamin Netanyahu over the weekend welcomed the Arab League's endorsement of peace talks with the Palestinians. While still waiting for a formal approval from the Palestinian Authority, Netanyahu stressed "that Israel wishes to resume the peace talks with the Palestinians at any time and at any place." Netanyahu said the talks are to be held "without preconditions." Members of the Arab League met Saturday in Cairo, Egypt, where they gave their conditional approval for the resumption of the indirect talks that have been stalled for over a year now. It was unclear when the talks would start. Procedurally, the Palestine Liberation Organization's executive committee needs to approve the start of negotiations, which is expected to happen this week. Chief Palestinian negotiator Saeb Erakat suggested a meeting between Palestinian President Mahmoud Abbas and U.S. envoy George Mitchell may take place as soon as Friday. "I think there is a meeting, but there is no confirmation yet," Erakat told CNN. Meanwhile, Hamas, the Islamic movement that rules Gaza, expressed its explicit objection to the indirect talks. "We reject all forms of negotiation with the Israeli occupation," Salah Al Bardail of Hamas said. "The American guarantees are [just] a new trick. We believe firmly that negotiations will result in negative consequences for the people and the Palestinian issue." The resumption of talks comes in the midst of tensions between Israel and Syria over allegations of long-range Scud missiles being transferred from Syria to Lebanon, targeting Israel's northern border. Speaking to Danish Foreign Minister Lene Espersen on Sunday, Israeli President Shimon Peres said, "Israel is certain that long-range, accurate Scud missiles are being smuggled from Syria into Lebanon. Syria must stop acting one way and speaking another way. Their support for terror can no longer be hidden."